Eagle soaring above view of bridge; vital bridge information in exergue. Inscription in ten lines within olive wreath. 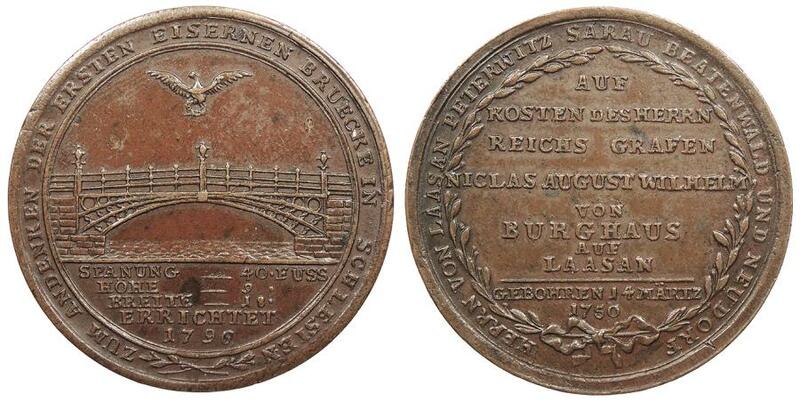 Commemorates first cast iron bridge in Silesia. The first cast iron bridge on the European continent was erected between 1794 and 1796 it spanned the 'Striegauer Wasser' near Lassen, Lower Silesia, Prussia. It was built under the direction of British engineer John Baildon.